Since the Pantry branched out into Weddings we are delighted and honoured to have been asked to be part of so many of your special days. From weddings in your neighbours amazing garden to marquees down south, we have loved them all. From the onset we wanted the Pantry’s rustic, homely feel to remain the heart of what we do in our wedding adventures. Our offerings of gorgeous mis-matched cutlery, table picnic style menus and Tuck Truck are perfect for all the DIY couples out there! Last summer flew by in a whirlwind of wedding love. Gorgeous brides, laugh out loud speeches, grooms shedding tears and drunk uncle dancing ……….we have seen it all. The one wedding that stands out however was that of Ian and Ashley. It was attending by two alpacas, had an enormous tree swing, flamingo cake topper, bingo after dinner and surprise singing waiters!! As you can imagine, guests left having had the time of their lives. From our initial meet with Ian and Ashley, we knew it was going to be awesome. 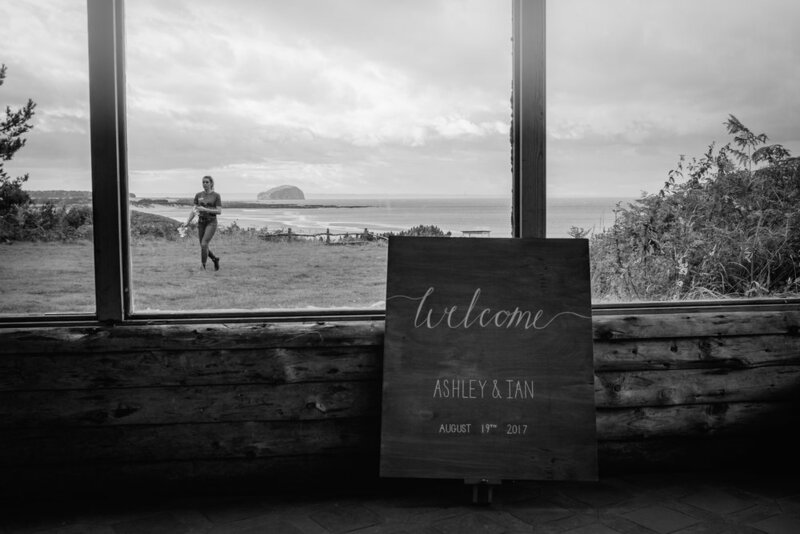 Ashley had so many amazing ideas for how she wanted the wedding to look and we couldn’t wait to help her make them real. The venue had a stunning beach view, log cabin, romantic twinkling lights spread all around outside, a flower crown station and don’t even get us started on the fire pit with sparklers!!! Oh yeah and let’s not forget that beautiful flower wedding arch! Following the ceremony, they had chosen to have a mix of some of our yummy canapes…..mull blue mouse and fig pastries, pork belly with apple, blackcurrant and vanilla puree and scallop lolly pops with hazelnut brown butter. All washed down with fizz served by our team! Cue the Alpacas entrance, one with a pretty flower crown and the other a dickie bow tie (you couldn’t make this up!) photo ready and eager to please……..wedding pros!! Inside the marquee was table foliage to trump all foliage. With gold cutlery entwined with a blush ribbon and candelabras galore. Ian and Ashley had picked a sharing starter and a table picnic style main course. Perfect to get your guests chatting and relax into the meal. The starter included our famous antipasti, miso glazed short ribs and haggis scotch eggs (Ian and Ashley later informed us that the guests said they were the BEST scotch eggs they had tasted!). Mains were a mix of beer can chicken, smoked brisket with chorizo hot pot and mushroom, feta and butternut squash strudel. A sign of a good meal was being asked by one guest to leave him a bowl of the chicken as he couldn’t bear to part with it!!! After dinner, a game of bingo ensued. With flamingo hats, whoopee cushions and inflatable dolphins for prizes. After the first dance was some amazing sax playing and then onto the DJ, who was smashing out some 90’s hip hop classics (and no way would you have found Charlotte and Jenn busting out a move or two behind the bar 😉 ) The bar was fully stocked by the Pantry to include some of our favourite local spirits and bottled beers. The night was in full swing! Later in the evening, led by a gorgeous trail of tea lights in the trees, our trusty Tuck Truck was lit with more romantic candles as we served out some tacos. From beginning to end, Team Pantry had Ian and Ashley covered. We set their tables, laid out their sweet treats table, served up the food, made sure their grannies had cushions on their chairs, topped up drinks and kept the bar going into wee hours, which made for a completely seamless day! And just when you thought the day couldn’t have gone better one of the guests informs you that “you are like Monica Gellar times a hundred, but hotter”. I mean if that’s not the bells and whistles of compliments, I don’t know what is! We would like to thank all the couples who have picked us to help them with their day and we cannot wait to be part of all the weddings coming up in 2018!